Stepping over somebody else is considered low class and even offensive. Just like you don’t step over Deities, prasadam, japa, holy books, and more, you don’t step over bodies, where the jivatma and the Paramatma are situated. What to speak about stepping over the Supreme Lord’s transcendental body. To do that would have meant to pay heavy bad results. Govinda was prepared to pay any karma, even going to hell, for the Lord’s service but not for his own sense gratification. So advanced was he. 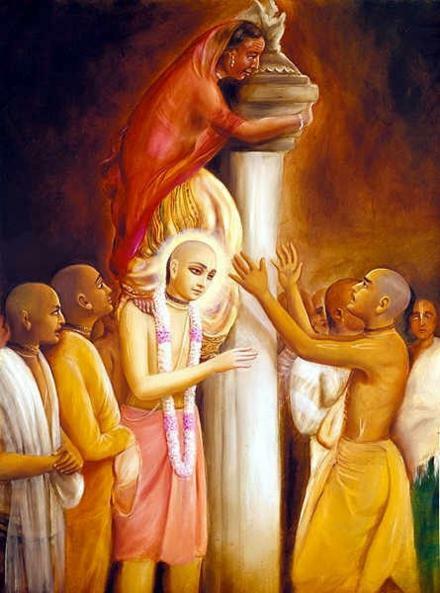 You can find the story of Govinda, Sri Caitanya Mahaprabhu’s personal servant, in Caitanya Caritamrita Antya Lila Chapter 10. There are a lot of Vaisnava etiquette to learn and we should be inquisitive about them. They are called Sadacara.